Centennial Trail History Walk leads hikers through Snohomish County’s past. Question: What was the first railroad to build into Snohomish County and what is much of its right-of-way called today? Want to learn more fun facts about Snohomish County heritage? Then grab your walking shoes or hop on a bike - or put the kids in the stroller and make your way down the Centennial Trail, Sunday, Sept 13th from 11a.m. – 3p.m. to learn local history along the former tribal route and early-century transportation corridor. The Snohomish County Historic Preservation Commission will offer activities for kids, hands-on interactive exhibits and a chance to touch historic artifacts at four different sites along the 30 miles of historic rail line. The event is free. Snohomish County started to develop sections of the Centennial Trail in 1989 during the State’s centennial celebration. Today the rail alignment is part of a developing regional trail network connecting to Woodinville, Monroe, Everett, Lake Stevens, Arlington and Skagit County. The Centennial Trail is one of the region’s most popular attractions. Walking, biking, skating and horseback riding activate the trail each and every day. The Centennial Trail provides safe access to local surface transportation for more than 520,000 users every year. 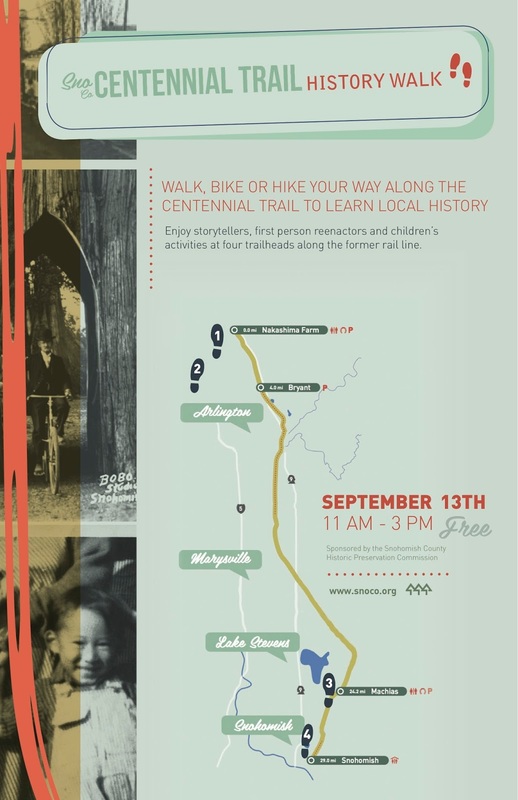 Can’t make it to the Centennial Trail History Walk? Don’t let that stop you from learning great stories of the people and industries that made an impact on our community in the fields of agriculture, timber and rail online at www.centennialtrail.com. For more information about the walk, contact Wendy Becker, Snohomish County Cultural and Economic Development Manager at wendy.becker@snoco.org.